More pretty food. More salmon. What can we say? Make this dish is what we can say. You will like it. 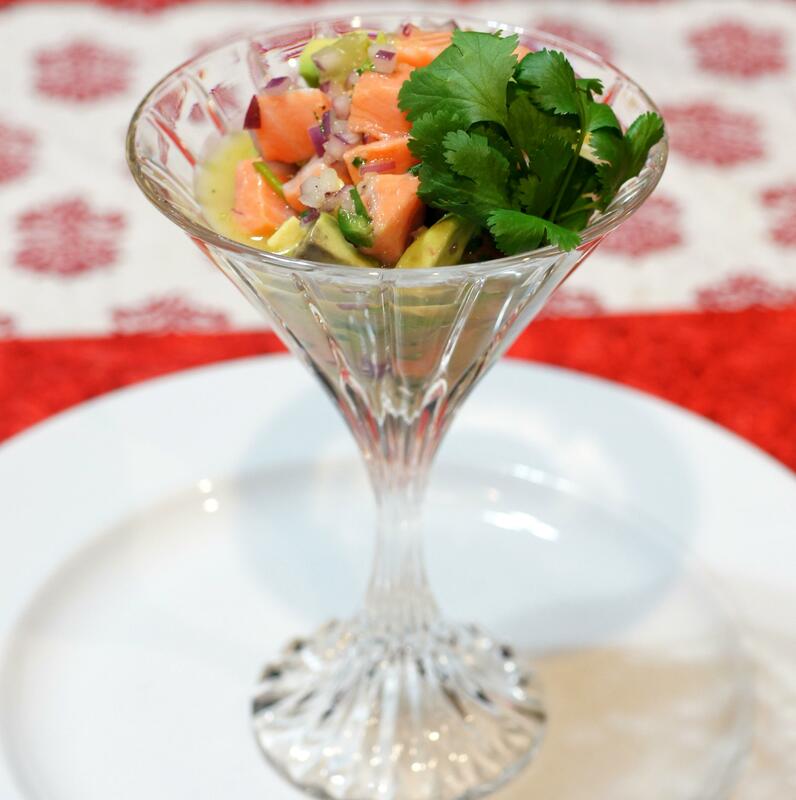 In a prior post on ceviche, Baby Lady’s Grouper Ceviche, we discussed a little of the history of ceviche and various forms of ceviche in Latin America and Mexico. Being fish lovers we like ceviche, a lot. 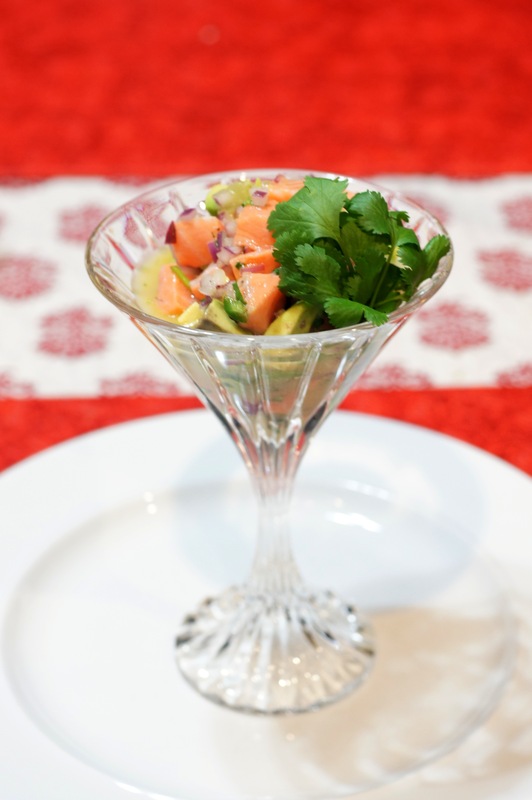 It’s versatile and there is such a great variety in ceviche dishes. 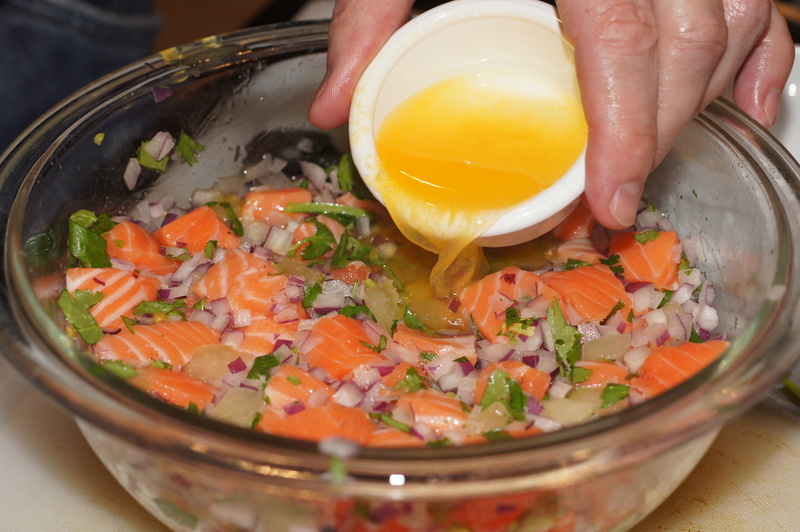 There are so many different types of seafood you can use in ceviche. 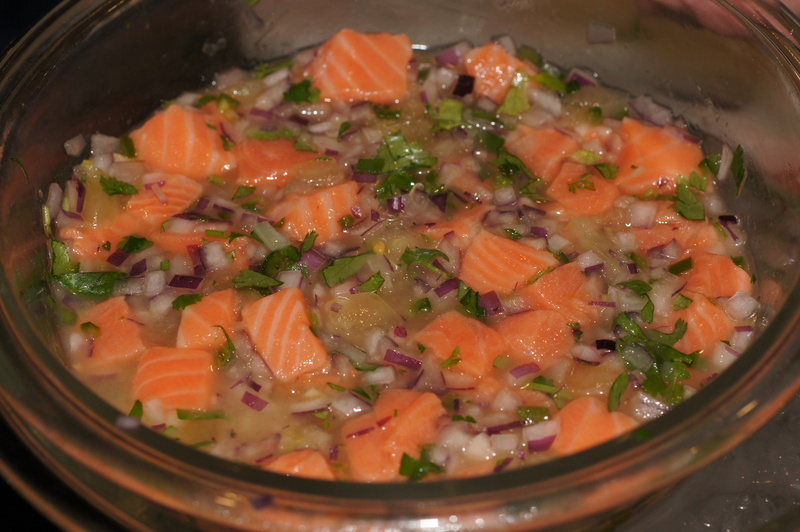 Shrimp, octopus, squid, tuna, mackerel, grouper, snapper, clams and sea bass are common seafoods use in ceviche. 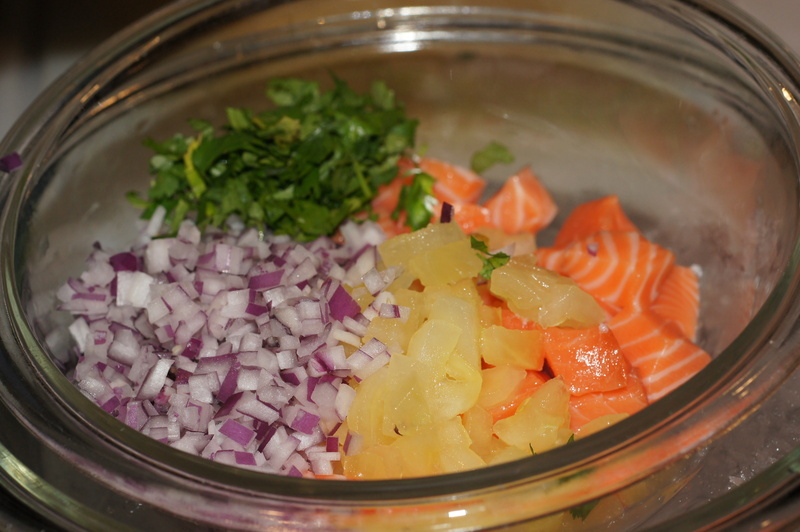 You can also use different types of citrus and blends to “cook” the seafood. 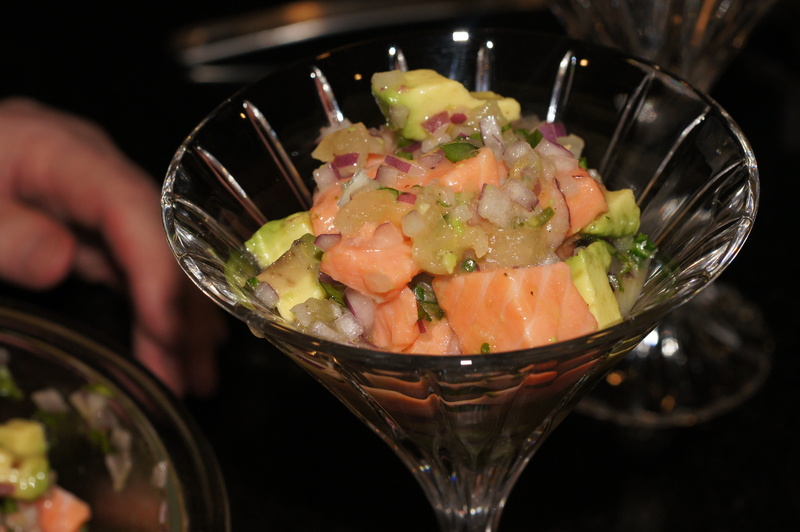 The only limitation on ceviche is your imagination. 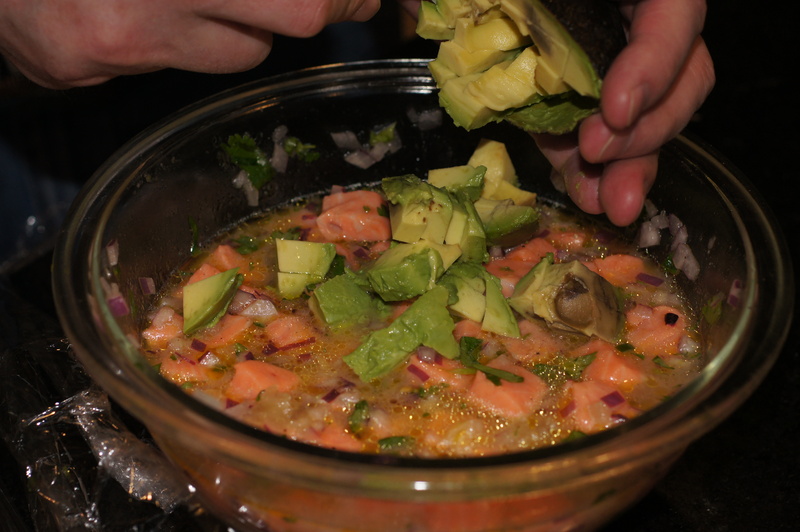 We were looking to broaden our horizons so we decided on a salmon ceviche. It was delicious and here is what we did. 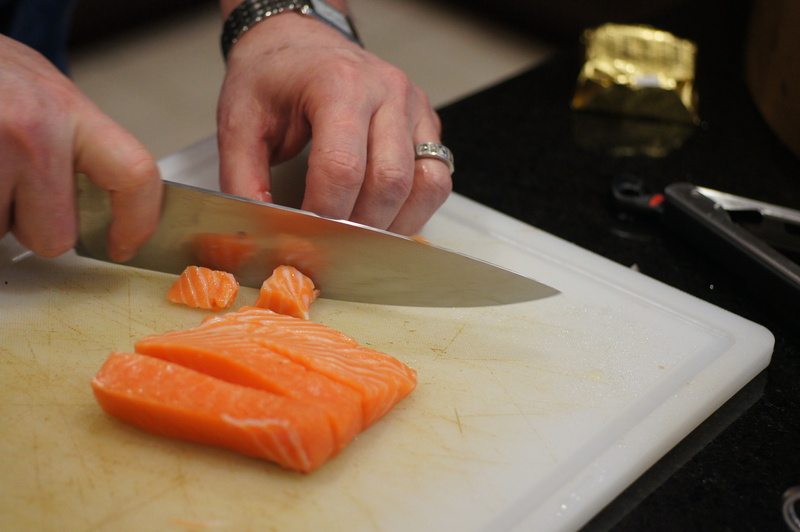 Using a very sharp knife so as not to crush the flesh of the salmon, cut the salmon into strips and then into 1/2 inch dice. 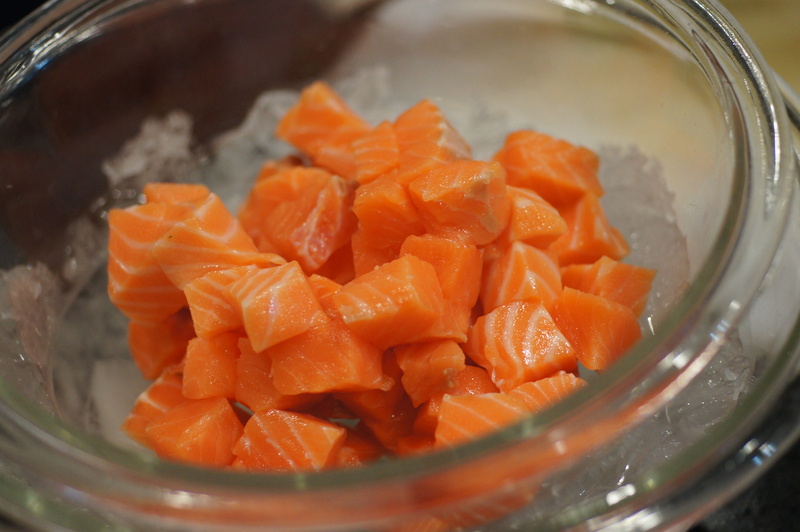 Add the salmon to a bowl over ice to keep the salmon cold. Except for the avocado, add all of the diced veggies, herbs, salt and pepper. Toss. Now add the various citrus juices. You need enough juice to cover all of the fish. Add blood orange olive oil, toss to incorporate and cover with plastic wrap. Refrigerate for 45 minutes. 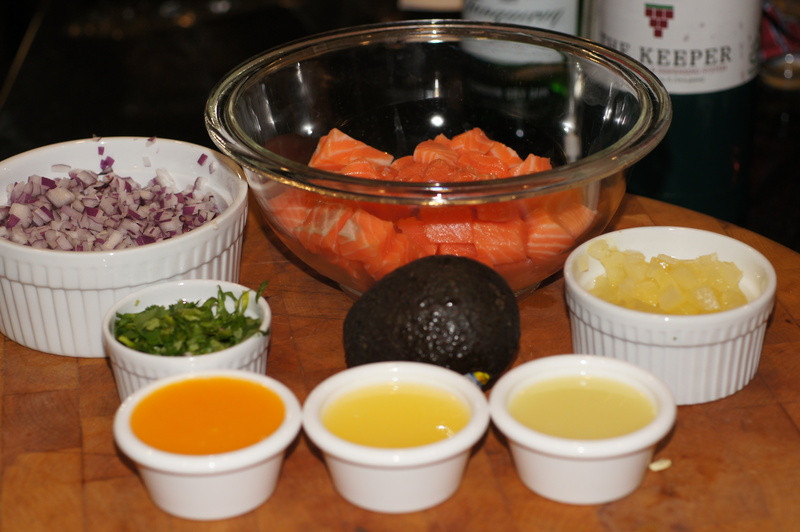 Dice the avocado and add to the ceviche. Toss to incorporate. Spoon into a martini glass or other serving vessel. Garnish with sprigs of cilantro. Serve & enjoy! Lovely looking creation. 31.9 inches of snow!? We have been forecast 1 (one) inch and already they are talking about traffic chaos tomorrow morning. We Londoners would think the Ice Age had started if we got that amount of snow. This ceviche looks so colorful. I look forward to making it. You know, we can send the snow your way. 🙂 We have plenty. This looks delicious and I will be trying this out at some point. Hi, Virginia. Thanks for the kind offer but I must pass. We don’t know what to do with the snow down here. 😉 When things finally thaw out and warm weather returns, give this a try. It’s very tasty. Love this! I’m a fish lover, too, and the 80ies shrimp cocktail presentation is great! Also like the addition of the orange oil. Hi, Stefan. Thanks for the nice compliment. The blood orange olive oil adds a nice, delicate orange flavor that lingers on your palate. It was a very nice compliment to the salmon. 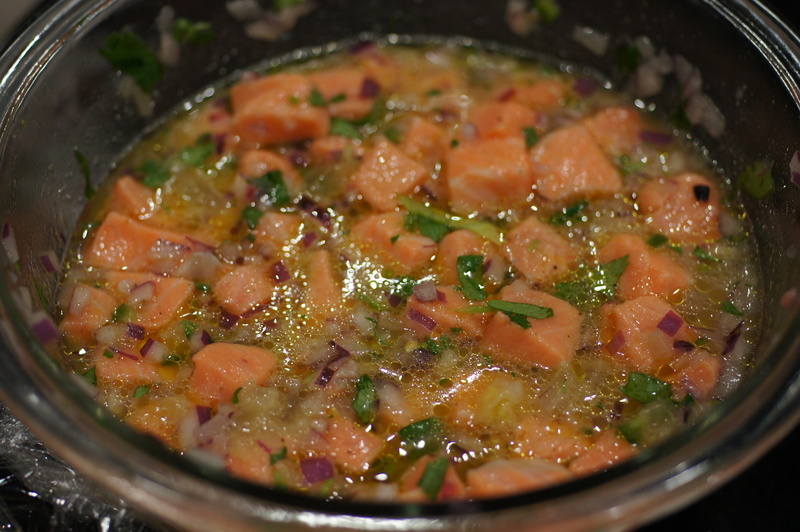 Hi Richard, I love the simplicity behind your ceviche. It’s something I often have (when out and about) dining, but confession, ice yet to make it at home. Sometimes it’s because I enjoy asian style sushi/sashimi but (most likely) because no one ever took me through the steps. I love citrus flavours so I’ll have to get to the fish markets soon and get cracking on some nice glasses too, very tres chic! Your seafood dishes always look lovely, though I do love the sound of an asian fish ceviche. They often combine it with something crunchy like nashi pear or (similar!) Sadly my guy is a fan of sushi & wasabi, but not ceviche with fruits, cést la vie! There will be no fruit in this one but it does use coconut milk and jalapeños. Your guy just might like this one.